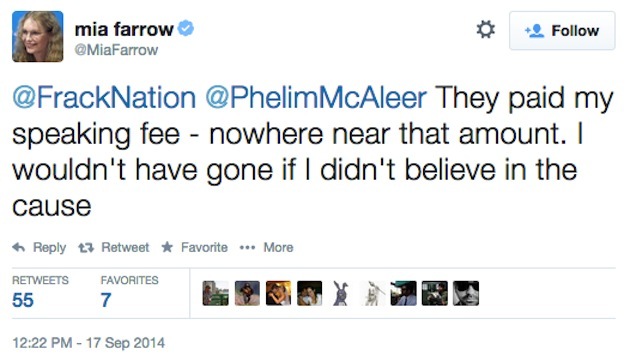 UPDATE 4:15 P.M.: Mia Farrow deleted her tweet Wednesday afternoon. Actress Mia Farrow on Wednesday confirmed that she was paid by agents of the Ecuadorian government to travel to the country and speak in support of the country’s legal and political battle against oil company Chevron. "They paid my speaking fee," she said in a message posted to Twitter. Farrow was responding to a Washington Free Beacon report revealing that MCSquared PR, a public relations firm that represents the Ecuadorian government in the United States, paid Farrow’s talent agency $188,000 last year. Farrow said that the amount that she personally received was substantially less than that. MCSquared also paid $330,000 to a speakers’ bureau representing actor Danny Glover. Both he and Farrow traveled to the South American nation to tour areas of the rainforest allegedly contaminated by Texaco, which was acquired by Chevron in 2001. "I wouldn't have gone if I didn't believe in the cause," Farrow said on Wednesday. Glover has not yet addressed the Free Beacon report. Neither talent agency returned requests for comment on that story.